Lesson 2: What is God Like? "This is life eternal, that they might know You the only true God, and Jesus Christ, whom You have sent" (John 17:3). God is so great and so wonderful that we can never know all there is to know about Him in the Bible. 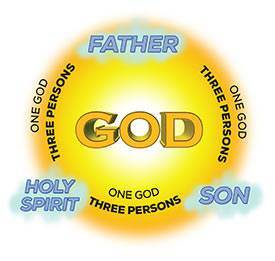 From the Bible we learn that there is only one God, yet He is in three persons—Father, Son and Holy Spirit. The Father is God, the Son is God, and the Holy Spirit is God. God the Father is in Heaven. God the Son is the Lord Jesus Christ, who came into this world to be our Savior. God the Holy Spirit dwells in the hearts of all who have received the Lord Jesus as their Savior. The Bible tells us many other things that are true about God. We are going to consider ten of them in this lesson. Have you ever wondered how the earth, the sun, the moon, and the stars came into being? God created them! This universe did not come into being by itself. God created it! 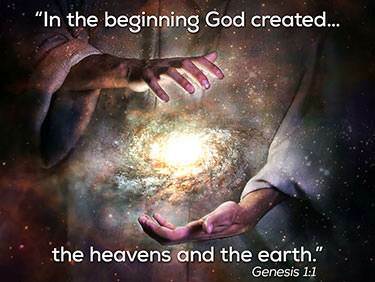 The very first verse in the Bible says, "In the beginning God created the heavens and the earth" (Genesis 1:1). We know that there is a God because we see what He has done. We see the wonderful things which He has created. The Bible says, "The heavens declare the glory of God; and the firmament shows His handiwork" (Psalm 19:1). God created us too! We are very special creatures because we were created in the image of God. The Bible says, "…God created man in His own image…" (Genesis1:27). 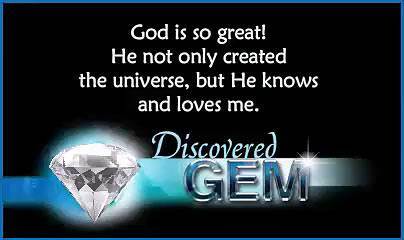 Of all the great and wonderful things which God created, do you know what God loves most? God Loves PEOPLE! And He is so great that He knows each one of us. He knows you and He loves you! You are worth more to Him than the whole world! This means that God had no beginning and He will have no end. Everything else in the universe had a beginning, but there never was a time when God did not exist. The Bible says, "…from everlasting to everlasting, You are God" (Psalm 90:2). This means that God is present in every place in His universe. God is very, very great! "Do not I fill heaven and earth? says the Lord" (Jeremiah 23:24). No matter where we are or where we may go, God is there. Perhaps you are wondering, "If God is everywhere why can't we see Him?" The reason we cannot see God is because God is a spirit. We cannot see a spirit. You have a body which we can see. But you also have a spirit which we cannot see. We can see your body, but no one can see your spirit. God is all spirit. He does not have a body, so we cannot see Him. But He sees us, and He hears us, and He loves us. Because God is God and because He is spirit, He can be everywhere at the same time. He is always with us wherever we are. This means that God knows all things. He knows everything that has happened, and He knows everything that is going to happen. God knows how many stars are in the sky. He calls them by name. He even knows the number of hairs on your head! Jesus said, "Even the very hairs of your head are all numbered…"(Luke 12:7). God knows all that we have said and done. He even knows what we think! He knows every secret. And He sees us at all times. 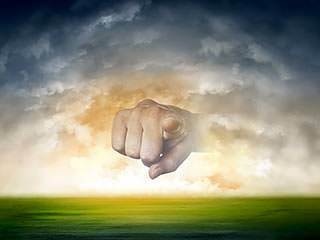 The Bible says, "You God see me…" (Genesis 16:13). This means that God is without any sin. God is all light and glory. Because God is holy, He hates sin and loves righteousness. In the Bible darkness stands for sin. The Bible says of God, "…God is light, and in Him is no darkness at all" (1 John 1:5). God once spoke to the prophet Isaiah in a vision. A vision is something like a dream. In that vision, Isaiah saw God upon His throne. Around the throne of God, angels were praising God. They were saying, "…Holy, holy, holy, is the LORD of hosts: the whole earth is full of His glory" (Isaiah 6:3). When Isaiah saw the vision, he was afraid. The vision showed him that God is holy, and he knew that he was sinful. He fell on his face and cried, "Woe is me! For I am undone..." (Isaiah 6:5). We, too, are sinful, yet God wants us to come to Him. And He has made a way so that we can come into His presence. When we take the Lord Jesus as our Savior, God sees us "in Christ." God says that we are clean and pure in His sight because we are "in Christ." This means that God always does what is right. Because He is holy and righteous, God must punish sin. We are sinners and God cannot overlook our sins or pretend that He does not know about them. The good news is that when we turn to God and take the Lord Jesus as our Savior, God forgives us of all our sins. 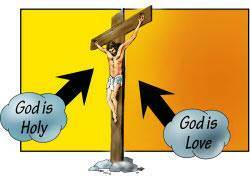 He does this because Jesus paid for all our sins by his death on the cross. The Bible says, "…your sins are forgiven you for His name's sake" (1 John 2:12). "God commends [shows] His love toward us, in that, while we were yet sinners, Christ died for us" (Romans 5:8). Because God loves us so much, He wants us to love Him and to trust Him. Sometimes people say, "If God loves me, why does He let me be sick? Why does He let troubles come to me?" Even though we may not know why things happen to us, God wants us to trust Him. Even when we are sick, or when troubles come, we must believe that God loves us and that He does what is best for us. This means that God always keeps His word. He always does what He says He will do. Do you ever make promises? Do you always keep your promises? I am afraid that we would have to say that we do not always keep our promises. Sometimes we forget. And sometimes we make promises that we cannot keep. But God never forgets! And God always keeps His promises. The Bible says, "…He is faithful that promised" (Hebrews 10:23). This means that God is always the same in His holy nature and character. God is always holy. He is always righteous. He is always just. He is always loving. God said of Himself, "I am the LORD, I change not…" (Malachi 3:6). Did you know that God once became a man? Yes, this is true. The Son of God once came into this world as a tiny baby. The Bible says, "For unto us a child is born, unto us a son is given…and His name shall be called… The mighty God…" (Isaiah 9:6). You may ask, "Is Jesus Christ really God?" Yes, He most certainly is! He came into this world as a tiny baby, born in a stable; yet He is "The mighty God." The Lord Jesus is a man; yet He is God. The Bible says, "…great is the mystery of godliness: God was manifest [seen] in the flesh…" (1 Timothy 3:16). Why did the Lord Jesus come into the world? He came because we needed a Savior! We are sinners. We have said wrong things. We have done wrong things. Because God is holy and just, He must punish sin. Because He is love, He gave His Son to die in our place. The most precious truth in all the Bible is that the Son of God loved us so much that He left Heaven and became a man so that He could die for our sins. 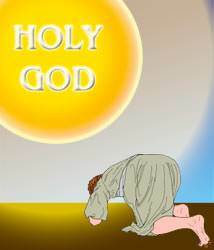 Now, because the Lord Jesus has died on the cross, God forgives the sins of all those who take Christ as their Savior. God does not overlook our sins, but He forgives them because He sees the blood of His Son which was shed for them. The Bible says, "…we have redemption through His blood, even the forgiveness of sins" (Colossians 1:14). Have you trusted the Lord Jesus as your Savior? If you have, then all your sins are forgiven. You are a child of God. God is your heavenly Father, and you can depend on Him for all your needs. What a wonderful thing this is! After reading about how great God is and how much He loves us, what does it make you want to do? It makes you want to worship Him and praise Him, doesn't it? And do you know, that is exactly what God wants you to do! Right now, why not find a quiet place where you can talk to God in prayer. Tell Him how great and wonderful you think He is. If there is some sin in your life, confess that sin to God. Thank Him for sending the Lord Jesus to die for your sins. Thank Him for saving you. Praise Him for His greatness and for His goodness. The Bible says, "Great is the LORD, and greatly to be praised…" (Psalm 145:3). Saving faith comes from careful attention to God's exact statements in His Word. It is also important to understand that we are not saved by what we do for God, but by what God has done for us in the person of His Son. Read God's exact statements in the verses below and then answer the questions (for yourself — these are not for online submission). Can you say now, "I know that I have eternal life because I have received God's Son as my Savior"?